A GRAMMY COMES HOME TO THE CARRIER FAMILY!!! Chubby Carrier has landed the 2011 Grammy for Louisiana Music!!! Big Daddy Roy is smiling down!!! DC BLUES LEGEND ROBERT LIGHTHOUSE RETURNS TO DC!! Robert has been spending much of his time in his homeland of Sweden but this weekend affords 2 chances to catch him in a band setting on his stateside home turf. CELEBRATION OF BUDDY HOLLY'S LIFE AND MUSIC MARKS ANNIVERSARY OF "THE DAY THE MUSIC DIED"
On February 3, 1959 Buddy Holly lost his life in a tragic plane crash outside Clear Lake Iowa, and the world lost one of the most creative and engaging performers of the rock and roll era. Though it has been more than fifty years, Buddy's music lives on to this day. 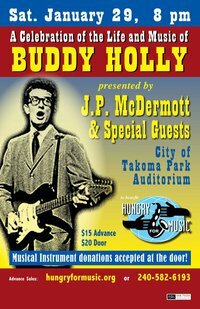 The Washington area will remember Buddy and celebrate his life and music with a concert on January 29th at the Takoma Park Municipal Auditorium featuring popular local rockabilly musician and devoted Holly fan, J.P. McDermott. Buddy Holly was only 22 years old on that bitter cold night when the light plane he was traveling in crashed in a corn field, killing all on board, and putting an end to one of the most creative and prolific careers of the rock and roll era. In a scant three years, Buddy left behind nearly 100 recordings, including at least 40 original songs, among them some of the greatest in the rock and roll canon. Though we lost Buddy, songs like "Peggy Sue", "It's So Easy", "Rave On", and "That'll Be The Day" live on through the years. Among the many acts that have covered Holly songs you'll find The Beatles, The Rolling Stones, Linda Rondstadt, The Knack, The Trashmen, Nancy Griffith, Skeeter Davis, The Thirteenth Floor Elevator, The Searchers, The Stray Cats, Conway Twitty, and Los Lobos, not to mention the Serendipity Singers, and many more. The concert will feature Buddy's exciting, fun, and heartfelt music all night long, with diversions into the careers of Ritchie Valens and the Big Bopper who also perished in the same plane crash. Washington Area Music Association award winner J.P. McDermott (Best Country Vocalist, Country Recording of the Year) will host the show. McDermott has an abiding love for Buddy's music, and has hosted Holly events for a number of years, including a lecture at the Smithsonian on Buddy's life and musical legacy. McDermott's love for Holly's music extends even to the name of his backing band — Western Bop. Buddy's original business card touted that he played both kinds of music — Western and Bop. Hard working and hard rocking DC area veteran musicians Bill Williams (guitar), Louie Newmyer (upright bass), and Tom Bowes (drums) make up the core of the band, joined by Chris Watling of The Grandsons on sax. The band will also be augmented with piano, organ, backing singers, and possibly strings to capture the sound of Holly's inventive music. music, or teachers who have willing pupils, but no instruments, are the beneficiaries. Says founder Jeff Campbell, "Most anyone will attest to the healing power of music; its ability to soothe in times of tension, its ability to transform sadness and aggression into hope and creativity." J.P. McDermott is a long-time supporter of the cause, and believes in the mission of sharing instruments and musical experiences, so that children who would not normally have the opportunity can experience a kind of freedom and self-discovery that is often stifled in an atmosphere of economic hardship. This event will be one of a kind, for a great cause, and one of the highlights of the Winter musical season! The show starts at 8:00. Tickets are $15 in advance, $20 at the door. "Trance Blues Certified Jam Workshop"
At the Archie's Blues Barbershop 4701 Queensbury Road, Riverdale Maryland. Otis Taylor (who has jammed with Muddy Waters, Hendrix and Springsteen) is holding this "acoustic blues" workshop on Sunday January 30th from 2:00pm to 4:00pm at Archie's Blues Barbershop. Cost for the workshop is $40. To register for the workshop send an email to info@acousticblues.com. Seating will be limited. All instruments, singers and songwriters are welcome to attend. Come out to learn, have fun and jam. Also go see Otis Taylor's Band at Blues Alley on Tuesday February 1st for two shows, 8pm and 10pm. Tickets are $25 bucks. With Otis Taylor, it’s best to expect the unexpected. While his music, an amalgamation of roots styles in their rawest form, discusses heavyweight issues like murder, homelessness, tyranny, and injustice, his personal style is lighthearted. Part of Taylor’s appeal is his contrasting character traits. But it is precisely this element of surprise that makes him one of the most compelling artists to emerge in recent years. In fact, Guitar Player magazine writes, “Otis Taylor is arguably the most relevant blues artist of our time.” Whether it’s his unique instrumentation (he fancies banjo and cello), or it’s the sudden sound of a female vocal, or a seemingly upbeat optimistic song takes a turn for the forlorn, what remains consistent is poignant storytelling based in truth and history. Truth and history are at the heart of Recapturing the Banjo, Taylor’s fifth release on Telarc. Released in February 2008, the album explores the deepest roots of the banjo – an instrument that, despite its common associations with American folk and bluegrass, actually originated in Africa and made its way to the fledgling American colonies in the 1700s via the influx of African slaves. Entertaining and enlightening at the same time, Recapturing the Banjo includes performances by some of the most accomplished African-American banjo players on the current roots music scene: Guy Davis, Corey Harris, Alvin Youngblood Hart, Keb Mo and Don Vappie. It was an absolutely incredibly great day at Slim's Y Ki Ki in Opelousas on New Years Day as well over 300 people from all over the country and Louisiana danced at the Keeping Roy's Dream Alive event. Money was raised to begin the repairs to the Offshore Lounge And Dikki Du will be keeping us informed on the progress and work. There are still a few of the special edition Roy Carrier Collection CDs available so if you want one just click on the buy CDs button att he top of the page. The Washington Blues Scene – 2011? What do you think the future holds for DC Blues?